You can see Flagstaff mountain from all three of the BFC cams. It’s one of my favorite rides with great views, a good workout and lots of fun descending. Last fall I recorded the ride for Fulgaz, a unique virtual cycling training app. I love riding all over the world with Fulgaz virtual rides and really wanted to try some local rides. Fulgaz is a long way from my younger days watching recordings of the Tour de France while riding a wind resistance trainer, now you can ride the climbs in the tour. The Super Flag ride is up now on Fulgaz, you can see a preview here. There’s a two week free trial, so if you’re used to riding Flagstaff give it a try and compare it to real life. Fulgaz has lots of info for how you get started, it’s a great app. There are more Boulder county and Colorado rides in the pipeline. You may have noticed the Boulder cam has not been updating for a couple weeks. The main problem has been a result of depending on network access from a construction cam co-located on the roof. That cam was shut down with completion of the building across the street and unexpectedly the network switch also stopped working. I have several alternatives set up and have to get on the roof sometime this week or next. I expect we should have a good long-term solution up and running again by early December. The timelapse feature was recently re-enabled for the Superior and Louisville cameras. The move to new hosting has been challenging and expensive. The camera images have a high number of requests daily and that eats up a lot of bandwidth. I’m using the Cloudflare CDN and will be working on caching techniques to reduce the cost of hosting this site. If anyone would like to donate to keep the cameras running or volunteer to provide Linux admin services, I’d love the help! All three of the cams have been down over the past two days, this is pretty unusual. The Superior cam had a hardware failure and needs to be sent in for work. The Louisville cam lost network access and had to be restarted. 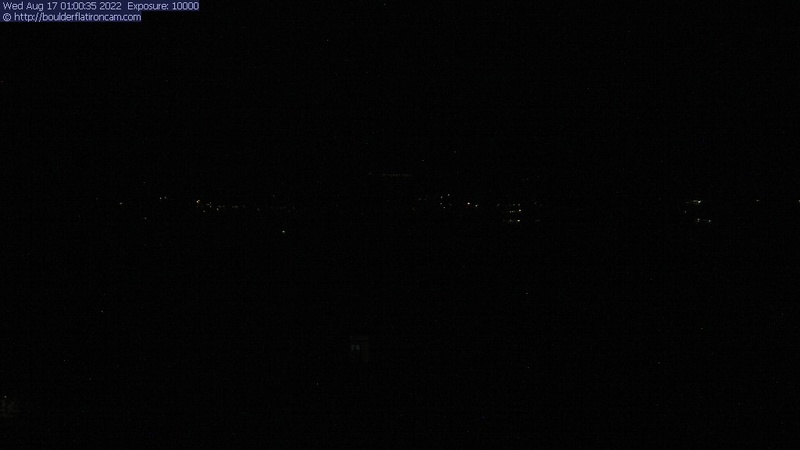 And tonight the intense storm that rolled through Boulder knocked the downtown Boulder cam offline. I think there was a power outage downtown so hopefully the cam will come back up with the Galvanize network and power. I’ll be out of town a few days so I hope that’s the case! The Louisville timelapse from April 3rd is a nice example of spring in Colorado. We had 4-5 inches of snow overnight and by afternoon it was almost gone. Using the year ago filter you can see it was almost a repeat of the previous year. The Ned Cam was a great resource to get a current view of Nederland. It seems that cam has been shut down and there’s new ownership of the NedNet ISP, so it seems unlikely to come back. If anyone knows the owner of the nedcam, please drop me a line. I’d like to put up a cam in Nederland with a nice view of Eldora and the Indian Peaks. Does anyone know of a good location or host? The site needs to have power and internet service and be willing to provide occasional access to the camera. It would be a great opportunity for a business to sponsor the cam. Please pass along any leads to info at boulderflatironcam.com or reply to this post. Some highlights of the new layout. The home page images are smaller so more cams can be added as we find locations. If you have a good view with internet service, drop us a line. Full size images are now on dedicated pages for each camera. The live images on all pages now auto update ever 30 seconds. You can leave the cam up and watch the changing weather. Archive images are now displayed in a gallery format where it’s easy to access the images and scroll through images from each day. Other Boulder cams page is a short list of cams located in Boulder County, but not affiliated with this site. Please give us a like or share if you like the new design! In the next few days we’ll be launching an updated site design. You can review here at the /blog link from the current site. The new site has auto-updating images so you can leave the site up and watch the weather change through the day. It also launches the new downtown Boulder cam located at Galvanize and supported by OpenSnow.com. Access to the cam archives and timelapse for each camera should be improved. You can easily click through the archive gallery now and the calendar selector should make it easier to go back to view days in the past. I’d love to hear feedback on the new layout or other ideas for the site. If anyone has a good location around Boulder county I’m interested in setting up more live cams. Just send your info through the feedback form. The old wireless bridge for the boulder flatiron cam failed again. We installed a new Apple Airport Express today and things seem to be humming along now. The new downtown Boulder cam has been having issues with the heat. It has to be sent back the manufacturer again to have the image processing board replaced. I hope to have it back by later next week.